Both LEED and WELL stress the importance of bringing stakeholders into the design process at the pre-design stage. With any building design and construction process, there are several moving parts so it is important to take the time in these early phases to set the stage well. With LEED, the intent of this integrative process is to get all disciplines involved in order to start thinking about the building systems as an interconnected network and not as separate entities – leading to a higher performing, more cost-effective solution. With WELL, the focus is more on future occupant behavior. 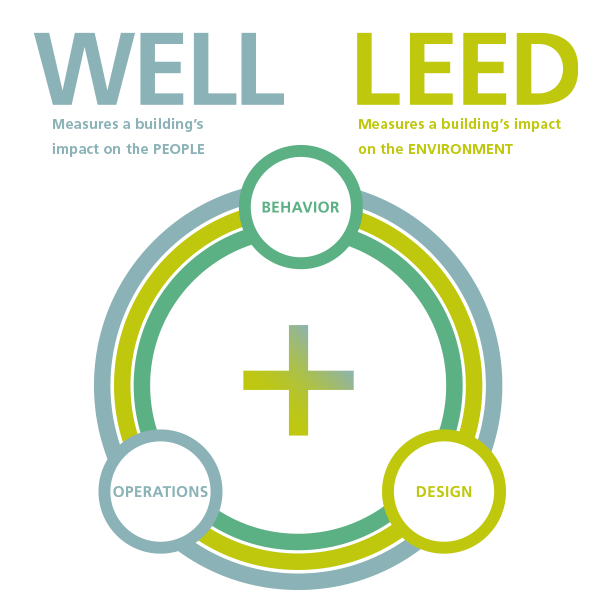 WELL uses the integrative design charrette to perform a values assessment and an alignment exercise so that design team members, owners and facilities managers understand the occupants’ needs and wellness goals. The WELL Building Standard’s Integrative Design Feature also requires a walk-through after construction completion to reiterate the importance of providing support for ensuring that the original project expectations will be maintained. While the intent for the integrative process is slightly different for LEED and WELL, it is easy to see how they complement each other.